Pink Sugar Bowl: Homemade Laundry Soap - no grating! 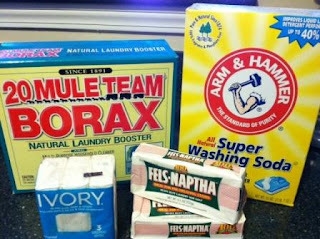 Homemade Laundry Soap - no grating! Awhile back my mom found a little soap experiment off Pinterest. I wish I knew the source so I could give due credit (if you know if it please comment and I'll add the link). When visiting her this past summer she put a bar of soap into the microwave, letting all her grandchildren watch it "grow". Afterwards I noticed it was a beautiful pile of melted soap, which after cooling down flaked quite nicely! So instead of the dreaded grating, we used the microwave to do the work for us. After the soap cooled down I flaked it and added it to the other ingredients for our homemade soap. Not only was it fun for the kids to watch, it also cut the prep time in half...thus making this homemade soap even cheaper as my time is definitely worth something to me! Have fun! 1 lidded container. Plastic or glass, whichever works best in your laundry room. Add Borax and washing soda to a container. Place one bar of unwrapped soap onto a microwave safe plate. Microwave for 30 seconds. Continue to heat in 30 second intervals until the soap has fully "melted". Remove carefully as the soap will be VERY hot. Let it cool completely, then flake apart. Continue with second bar. Add flaked soap to the container of Borax and washing soda. I have a front load washing machine and use 1/4 cup of this soap for each large load. I have found homemade laundry detergent works best with warm and hot water settings. For cold water settings I still use liquid Ivory Snow. I don't own a microwave (by choice), but I think this is a great idea!